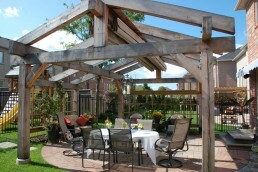 This homeowner is an engineer that envisioned a post and beam frame to cover his outdoor entertaining area. 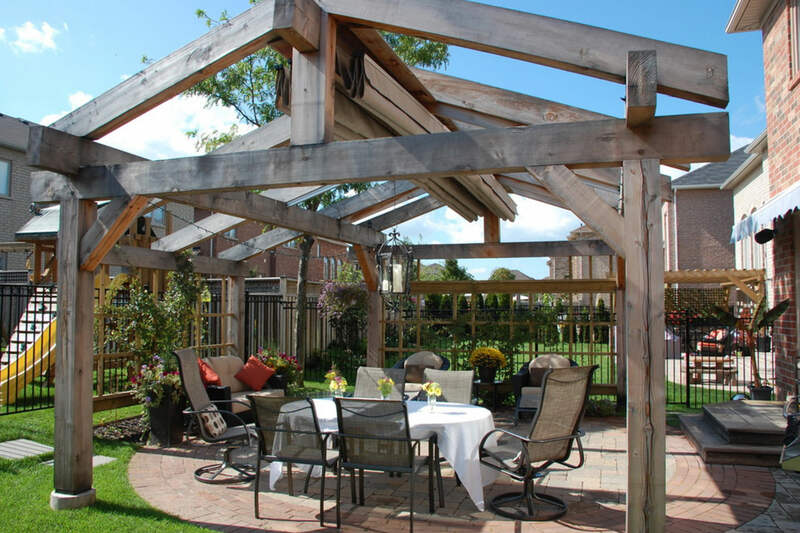 It’s a beautiful example of do-it-yourself ingenuity and skill and we compliment him on the impressive results. 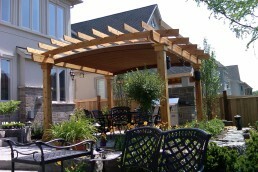 ShadeFX was called in to provide the canopies which are required to retract on a steep slope against gravity. 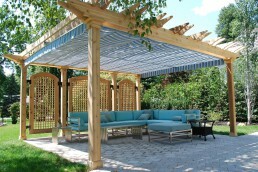 This was the first installation of this type for ShadeFX and we were up to the challenge. For this project, the orientation of the canopies has them extending only six feet while they are twenty feet wide. 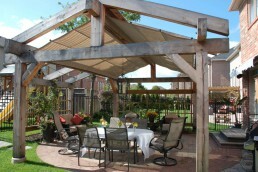 The result has proven rugged and durable as the canopies have already survived an extreme bout of unexpected weather. 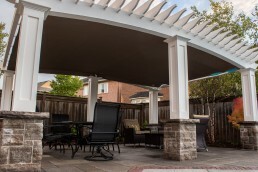 Southern Ontario gets its fair share of severe thunderstorms and these canopies were extended during a close call with a microburst. We were thrilled to hear they came through none the worse for wear. The same can’t be said for a number of items in the yard which did suffer damage. When fully retracted these canopies snug up under a small roof covering to protect against the snow and tree debris of the Canadian winter. The small cover follows the peak of the frame and is rather difficult to see. 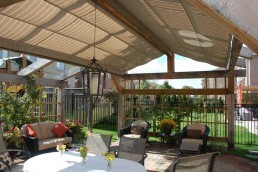 It also covers the gap between the canopies and supports the light fixture. 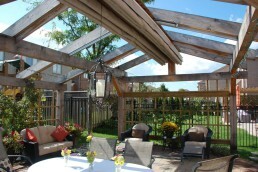 This project is in Oakville, Ontario and has been providing sun and rain protection with style since 2009.